Omnicom (OMC) was formed in 1986 and is one of the largest providers of advertising and marketing communication services to over 5,000 clients in more than 100 countries. As a full-service agency, Omnicom provides numerous services, including designing ad campaigns, making the actual ads, determining where the ads should be placed and distributed, media buying, account management, public relations, consulting, and more. Most clients use ad agencies to perform all tasks of a campaign and prefer to conduct most of their business with just one or two agencies to streamline costs and efficiencies. Omnicom holds more than 1,500 advertising agencies that specialize in over 30 marketing disciplines, including branding, content marketing, digital marketing, data analytics, instore design, advertising, social media marketing, search engine optimization, and more. The company groups its services in the following fundamental disciplines: Advertising (53% of sales), CRM Consumer Experience (17%), CRM Execution & Support (14%), Public Relations (9%), and Healthcare (6%). Omnicom's agencies serve virtually all industries, including: food and beverage (13%), pharma and healthcare (12%), consumer products (10%), auto (10%), technology (9%), financial services (7%), retail (6%), travel and entertainment (6%), telecom (5%), and other (22%). The company is well diversified by client as well. In 2017, its largest client represented 3% of revenue, and its top 100 clients represented 51% of Omnicom's total sales. Some of the firm's notable customers include Apple, Adidas, McDonald's, Nissan, PepsiCo, Pfizer, Johnson & Johnson, Exxon Mobil, Unilever, Mars, and Volkswagen. By geography, North America is Omnicom's most significant region, accounting for 57% of sales. However, the company also has a meaningful presence in Europe (27% - about a third is the U.K.), Asia Pacific (11%), Latin America (3%), and the Middle East and Africa (2%). While the industry continues evolving in today's digital age, it has historically been a good place for long-term investors to play. According to Advertising Age, five agency networks control about 70% of global ad agency revenues – WPP Group, Omnicom, Publicis Groupe, Interpublic Group, and Dentsu. However, there are thousands and thousands of small agencies in the industry – over 80% have fewer than 10 employees. In this industry, bigger is certainly better for several reasons. First, large multinational clients spend a lot on advertising and are constantly looking for ways to improve their return on investment. One of the easiest and clearest ways to boost returns is to control their costs and use their size to gain efficiencies. Rather than spread their work across multiple agencies, clients typically prefer to work with only one or two agencies because it gives them some negotiating leverage and maximizes the efficiency of their marketing spend. In most cases, only the biggest ad agencies can check all of the boxes that big multinational clients demand. Larger agencies benefit from being able to offer numerous marketing services, establishing themselves as true one-stop shops for the biggest clients. For example, Omnicom says that its top 100 clients, which represent 51% of its sales, were each served, on average by more than 50 of its agencies. Omnicom’s largest client was served by more than 250 of its agencies last year. Big clients operating all over the world still need a unified marketing campaign, requiring work on a global scale that only the biggest ad agencies can provide. Smaller firms lack the breadth of services, skills, and geographical reach to compete for large accounts, leaving them trapped as niche players in most cases. As globalization and the importance of international markets continue increasing, it wouldn’t be surprised to see the industry continue to consolidate. These are some of the reasons why the largest ad agencies generally achieve much higher margins (10% to 15%) compared to smaller agencies (6% to 8%). Switching costs have also been favorable in the industry. While the largest players occasionally trade clients, it’s important to remember how closely agencies work with their clients, establishing a deep understanding of the brands, unique value propositions, and customers. Many relationships span decades of time, creating high knowledge barriers that take considerable time to replicate. The knowledge agencies build up about specific clients creates another unique switching cost – client conflicts. If you were the Chief Marketing Officer of Coca-Cola, would you want the same agency you used to also take on Pepsi’s account? Probably not. Given the limited choice of big ad agencies (recall that the top five ad agencies account for around 70% of the industry’s revenue), large multinational clients have few conflict-free alternatives to turn to for their marketing needs. For these reasons, media agency relationships tend to be stable – most client reviews historically took place only every 5-10 years, according to MediaCom’s COO Toby Jenner. The biggest change rippling through the industry today is the rapid rise of digital advertising and all of the data and analytics that come with it. According to eMarketer, online ad spending topped print magazine and newspaper ad spending for the first time in 2012. 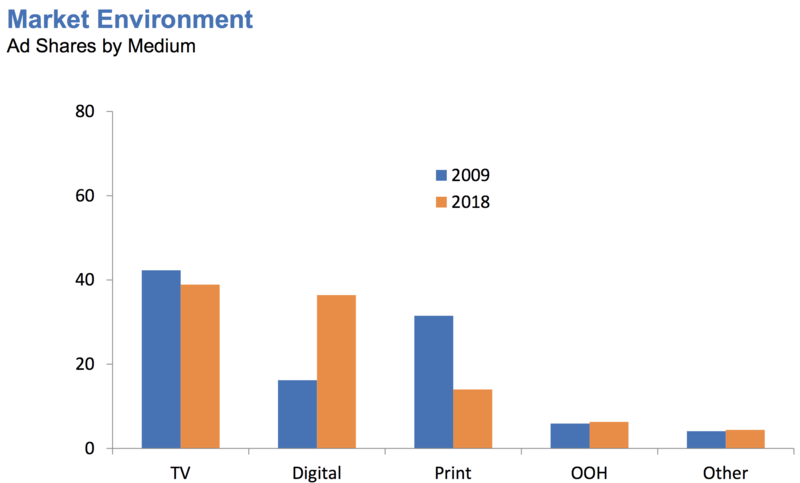 As you can see below, the industry's share of digital marketing has more than doubled since 2009, while traditional mediums such as TV and especially print have seen their ad shares decline. Simply put, consumers today can be reached through more mediums than ever before, causing all marketers to rethink their strategies and budgeting decisions in an effort to reach their target audiences in a cost-effective way. While the landscape is still evolving, it's possible the slew of new advertising forms will only serve to make the biggest ad agencies stronger and more wedded with their clients. The need to develop a unified marketing message remains, but the challenges of which demographic to reach, how to reach them and what to say only increase with more advertising forms available. Firms with the most resources to invest in digital capabilities and make sense of the fragmented media world could continue to distance themselves in the one-stop shop ad agency game. On this note, Omnicom is estimated to derive over 30% of its revenue today from digital marketing activities. From a growth perspective, advertising spending is generally driven by corporate profits and consumer spending trends. 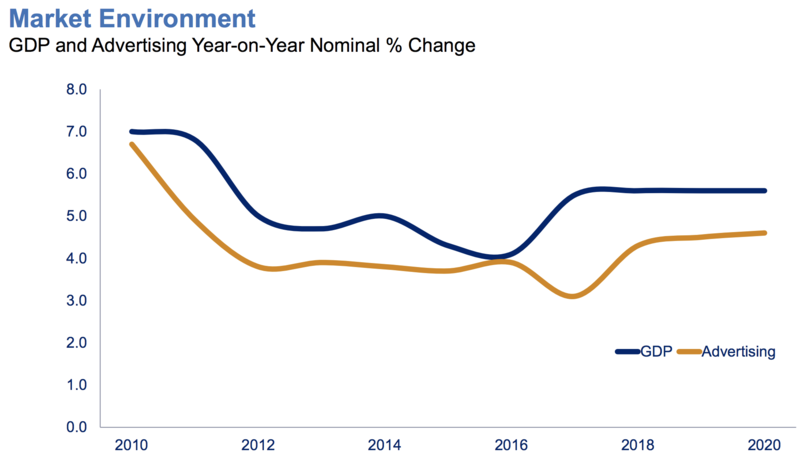 The chart below demonstrates that marketing expenditures have a high correlation to GDP, which bodes well for Omnicom's ability to continue profitably growing its business over the long term. Even during difficult times, brands still need to maintain their reputation and awareness in the market. This helps reduce some of the industry’s cyclicality (industry sales were down less than 10% in 2009 and have grown at a consistent single-digit pace most years). Overall, Omnicom appears to be a business with meaningful staying power. The firm is well diversified by geography, industry, and client. It benefits from longstanding customer relationships and has the global scale needed to effectively adapt as the proliferation of media channels continues. The rise of digital media is causing the most change across the industry. Digital advertising sales surpassed TV in 2017, reaching a 41% market share, according to MAGNA. The research firm expects online and mobile advertising sales to continue growing at a double-digit annual clip, pushing digital advertising's market share to 50% (over $290 billion) by 2020. Meanwhile, MAGNA expects total offline advertising sales (linear television, print, radio, out-of-home) to decline 0.5% this year. Digital media is much more fragmented as the rise of connected devices has enabled content consumption across smartphones, tablets, computers, and more. Ad agencies have become tasked with developing effective cross-platform marketing solutions with tangible results, a meaningful evolution from the past. As a result of digital marketing’s surge, and perhaps a desire to cut costs, many of the industry’s biggest clients are reevaluating the digital skills and abilities of their existing ad agencies. A record amount of annual contracts were put out for tender / review over the last three years, for example. More than ever before, marketers want to know how their ad dollars are being spent, especially as it relates to media buying activities and the digital capabilities of their existing ad agencies. Omnicom noted that it recorded an overall net gain in new business last year, and the company believes there is around $15 billion worth of new accounts that are in review today. Fortunately, Omnicom thinks it is only at risk defending about $2 billion of that total amount, meaning the rest of it is an opportunity for share gains. However, investors can't shake off concerns about the overall industry's decelerating growth, especially in light of the strengthening global economy. The chart below shows each major agency company's two year revenue growth, which combines growth for the named quarter and the same quarter one year earlier. 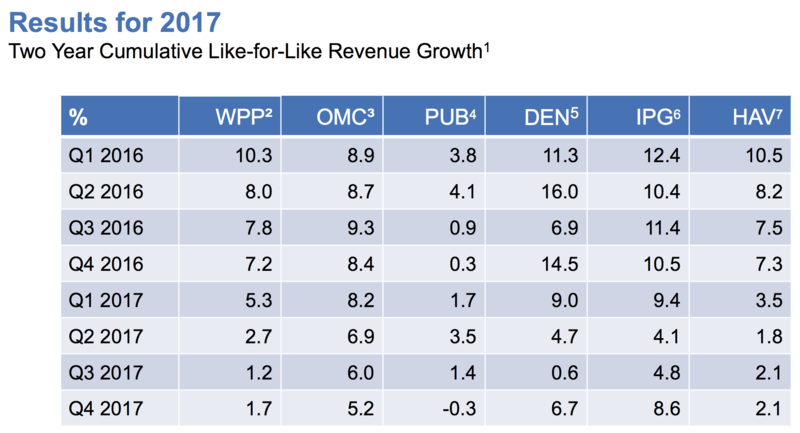 Omnicom's results are in the second column ("OMC"), and it has fared better than most of its major peers. However, it has still experienced meaningful deceleration. Investors are wondering why the major ad agencies are struggling so much in this environment. Are digital-focused businesses (Google, Facebook, etc.) going direct to advertising clients, disrupting the industry's status quo and reducing the need for companies such as Omnicom? Is branding still valued highly by consumer products giants, many of whom are struggling to achieve profitable growth as consumer tastes and shopping habits change? Are more clients moving their marketing activities in-house for greater control and perhaps lower costs? Answering these questions isn't easy, and it could take years to gain clarity on many of these issues as the industry continues evolving. For now, it seems like many of the headwinds in recent years are more cyclical than structural in nature. Many big ad spenders like P&G are struggling to achieve meaningful top line growth and have reduced some of their marketing expenditures, for example. P&G also commented that it slashed its digital ad budget by more than $100 million during one quarter in 2017 to eliminate ineffective areas without having its growth impacted. Adweek also notes that many large clients are reducing media fees they pay and shifting toward project-based assignments, which shrink the value of a creative agency account win. With global advertising spending likely to continue rising at a low to mid-single-digit pace over the long term, plus the healthy industry diversification each major ad agency enjoys, it's hard to imagine these headwinds persisting far into the future. Obviously those comments are encouraging to hear, but it's really hard to say how the competitive landscape could evolve from here. Agencies like Omnicom certainly have vast amounts of data that can be leveraged by partnering with firms such as Google, and their agency networks cover the entire spectrum of marketing activities that clients need help with. Omnicom expects organic sales growth of 2% to 3% in 2018, so the business continues plodding ahead for now. In an increasingly tech-driven world, advertising firms seem likely to remain important for clients facing disruption to their business models. Omnicom also has the financial health to make any necessary investments it needs to adapt to better serve its clients. Omnicom has long enjoyed a predictable and profitable business model, which has allowed the company to pay uninterrupted dividends since its founding in 1986 and boost its dividend each year since 2010. Despite the recent slowdown in growth, management's ongoing confidence in the business was demonstrated by the board's decision to increase Omnicom's dividend by 9% in October 2017. While there are plenty of fears and uncertainties swirling around the ad agency industry's long-term growth potential, many of today's challenges seem more cyclical in nature (e.g. struggling consumer goods firms reducing ad spending). The rapid shift to digital advertising is here to stay and will only continue in the future, but Omnicom appears to be making the necessary investments to keep its business very relevant in this area as well. Overall, Omnicom is arguably one of the best companies in its industry, has a number of enduring competitive advantages, and seems likely to continue rewarding shareholders with at least mid-single-digit dividend growth for the foreseeable future.